First lady Melania Trump and her son Barron Trump, look at the Wisconsin-grown Christmas Tree on Monday at the North Portico of the White House in Washington. The tree will be displayed in the White House Blue Room. WASHINGTON — Melania Trump and son Barron joined in a time-honored tradition of receiving the official White House Christmas tree, which will become the showstopper for a president who has vowed to put Christmas back at the center of the winter holidays. 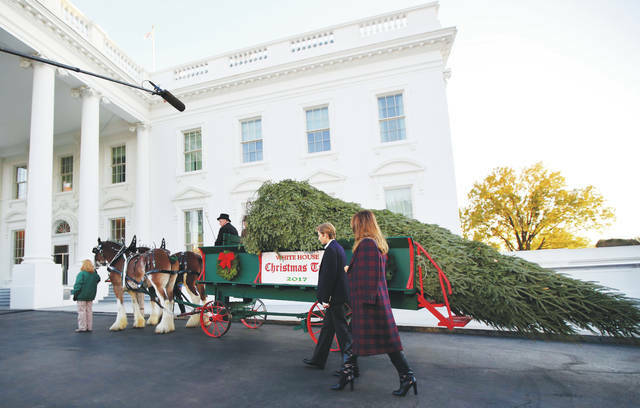 A military quartet played holiday tunes Monday as a horse-drawn wagon carried the 19 1/2-foot (5.9-meter) Balsam fir from Wisconsin up the White House driveway. The first lady, wearing a red turtleneck and a coat draped over her shoulders, and 11-year-old Barron, in a dark suit coat, white shirt and dark slacks, circled the tree and then visited with growers Jim and Diane Chapman. The Chapmans own a Wisconsin Christmas tree farm and won an annual contest sponsored by the National Christmas Tree Association. After Mrs. Trump and Barron gave their symbolic approval, the tree was carefully carted off to the Blue Room where, after a slight trim and the removal of a monstrous chandelier, it will take center stage. The tree for the Blue Room usually arrives the day after Thanksgiving, but it was delivered early this year to accommodate the Trumps, who are spending the holiday at their Mar-a-Lago estate in Palm Beach, Florida. While the Trumps are away, a small army of volunteer decorators and florists from around the country will descend on the White House on Friday and spend the holiday weekend transforming the 132-room mansion for Christmas, complete with a tree in every public room.